Thrifty Crafty Girl: Curse You, Internet Hackers. I had my blog professionally designed by Kimberly over at seven thirty three. She is amazing. I just wanted to alert you all in case you thought you were on the wrong blog. You're in the right place. You are safe now. As I recently blogged, my computer came down with a nasty little virus. And can I just say, I wasn't even looking at bad stuff on my computer? Like, it wasn't from downloading some less-than-appropriate video or something... I was totally innocent and they found me and poisoned my computer. And for that, they must be punished. May you never again find a pair of pants that fit well. May you always feel like there is a pebble in your shoe but never be able to find it. May they always put extra onions on your burger when you have an important meeting. May you always hear your cell phone chirping that you have a text, but you never have a text. May you always have something in your eye that makes your vision just blurry enough to be annoying. May you be the only one in the group that never gets the joke. May the joke mostly be about you. May there never be enough toilet paper on the roll when you really, really need it. May you always have something stuck in your teeth but never know it. May you never be able to afford to move out of your mother's basement. That's right folks, I pulled out the big guns. Be afraid... be very afraid. The new look is great. hahaha - Believe me, I know what you mean. Oh snap, they're really in for it now!! Pebbley shoe - ouch! Oh WOW! Check you out in your new "makeover"!! Nicely done!! Looks great! Dang virus creating worthless people. Girlie, you! crack! me! up! Great punishment, (note to self-never piss Priscilla off!!! )I like the blog look. 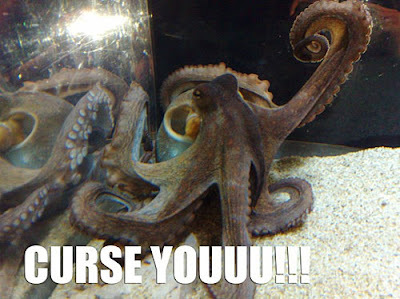 oh my word that is SO funny...loved all of the "curses" (and the picture just totally made it too)!! SO funny! Your new design looks great! You HAVE pulled out the big guns, holy moly, and karma WILL get them, so you win! Very nice, Priscilla! :-) Love it.